Jerry and I are usually not big resort kind of people. We tend to stay in out-of-the-way little B & Bs or cottages on the beach. 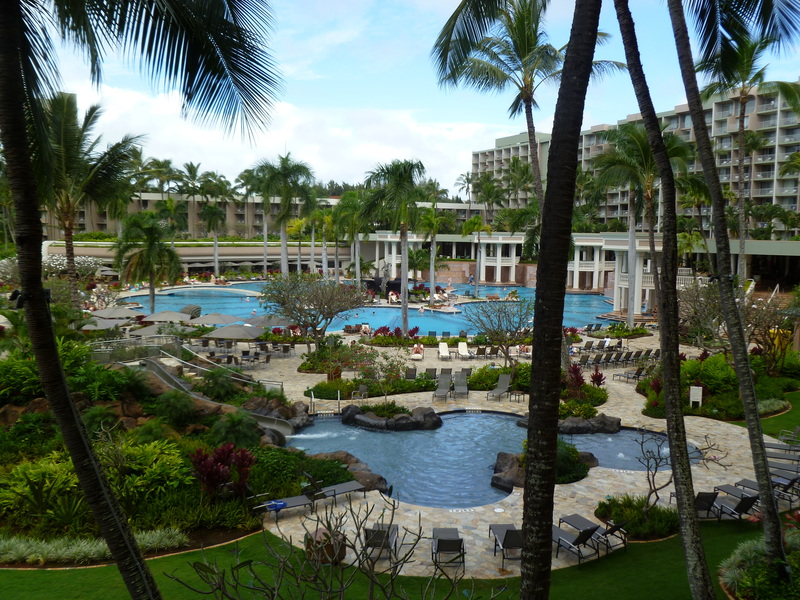 But we love the Kauai Marriott. Even when it’s nearly sold out, it still somehow maintains a sense of not being crowded. The grounds seem to be big enough to absorb the sounds and sights of lots of people. The staff at the Kauai Marriott are exemplary. They are unobstrusive but greet guests in a friendly manner. We loved the two women bartenders at the bar next to the sushi bar. They are terrific mixologists and super friendly. The pupu were absolutely delicious, too. Gotta try the Mongolian beef! At the bar we met a really nice couple from the Bay Area. She had owned an art gallery for many years and she gave us some excellent advice on how to work with galleries. Now she has subscribed to my blog! 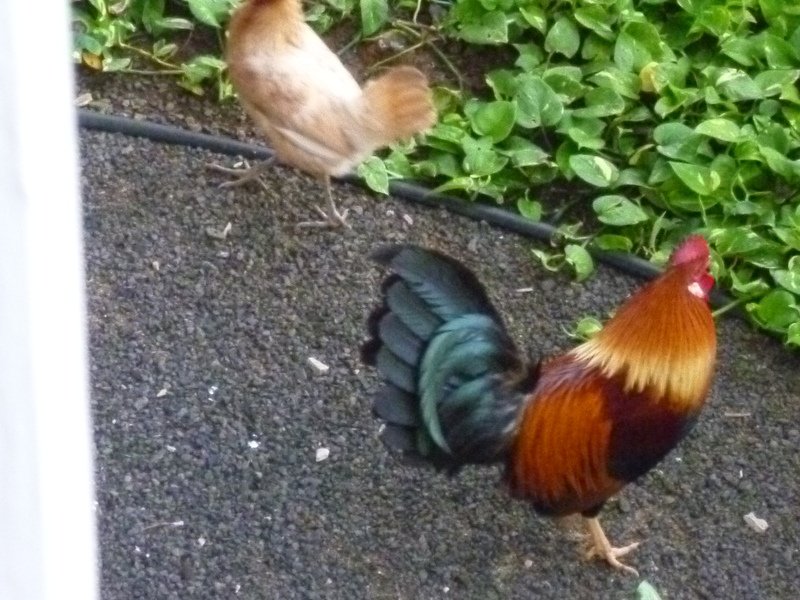 One fun thing about Kauai, and even at the Kauai Marriott: There are roosters, hens and chickens everywhere. Apparently a few got out of their cages during Hurricane Iniki and they went crazy breeding and taking over the island. The rooster above is clearly king at the Marriott. 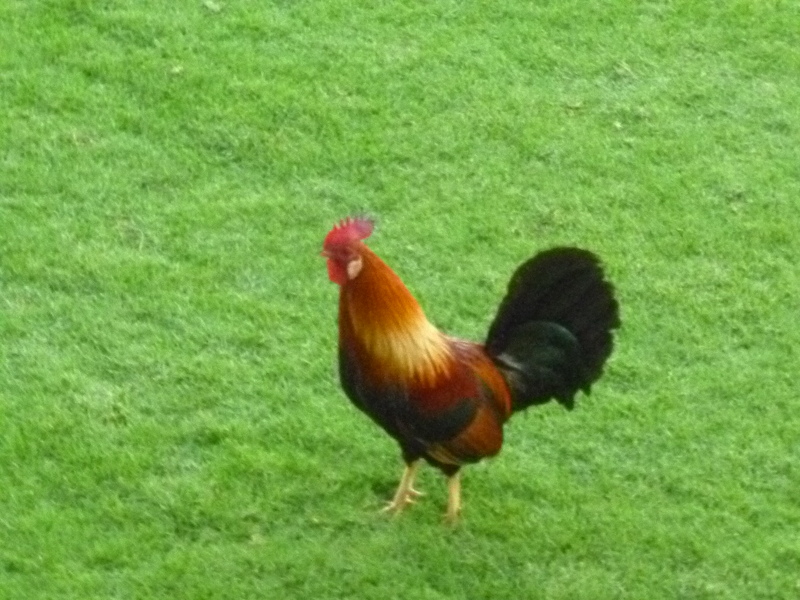 He commands respect in a very noisy manner, but what fun to hear a rooster crowing from your hotel balcony! He has a following of several hens and he will fight any rooster who comes around them. We watched with great amusement as he controlled his territory. He even flew up into the plumeria trees to fend off the aggressors. The rooster and "his" hen. 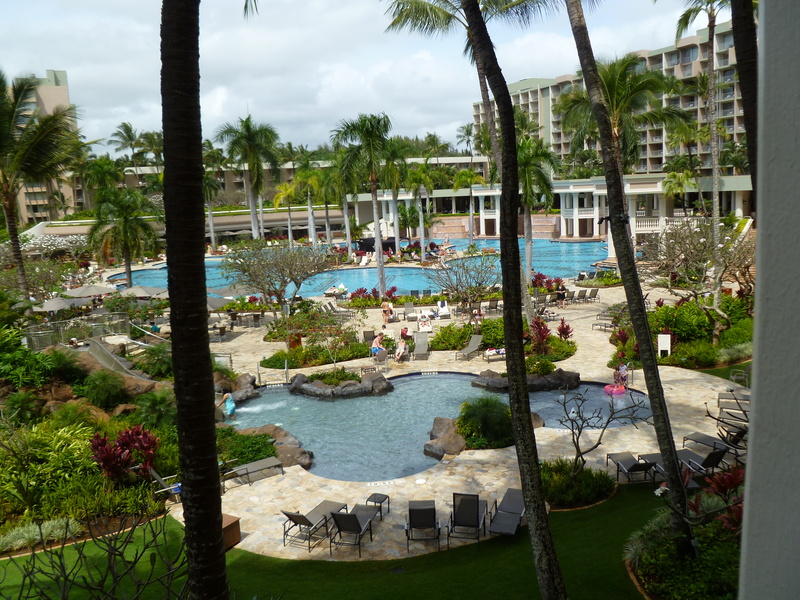 Perhaps our favorite thing about the Kauai Marriott is the pool. We love to swim laps and this pool is so huge, with five distinct but connected sections, that you can swim circular laps which is a long, long swim without having to stop and turn. We were the only people in the pool at 7:30 a.m. so we didn’t even have to worry about swimming into someone. Loved it! There are also five jacuzzis around the pool so we would do our laps, then jump in the jacuzzi. So relaxing! We can’t wait to return……. A great pool for swimming circular laps! This entry was posted in Travel and tagged Kauai Marriott. Bookmark the permalink. Sounds like you guys had a blast on Kauai! I really enjoyed my visit there last September, it’s nice to get away from Oahu sometimes.